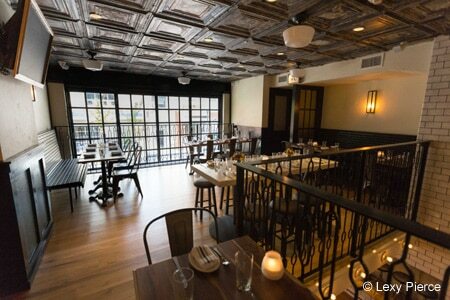 Trendy Rittenhouse eatery honors all things carnivorous. : Even amid a vegan dining boom, chefs Evan Turney and John Strain wager that diners still want to sink their teeth into something substantial. Butcher Bar occupies a dramatic bi-level space with the “bar” portion and an open kitchen taking up most of the lower floor. On the menu, of course, is meat and more meat. A board of cured salamis and cheeses; sloppy joe poutine; and chicken liver mousses served with bittersweet chocolate, toasted hazelnut and brandied cherries start the proceedings. Next choose one of the creative meatball and sausage sandwiches (the turducken involves cornbread stuffing and mushroom gravy on top of the mixed poultry link). Or try a fire-kissed specialty such as the smoked wild boar ribs or a bone-in rib-eye with caramelized onion and red wine demi-glace. Desserts like a skillet cookie with ice cream keep in line with the previous courses’ indulgence. The beverage program encompasses 16 draft beers, six draft wines and a brown-liquor focused cocktail menu.